Connected devices don't have to be complex to be useful. Take the smart plug: it simply turns things on and off, but - when connected to a smart home platform - becomes a very versatile device. Controlled by an app, a smart plug lets you turn on and off any appliance that plugs into a standard wall socket. As part of a solution like Alarm.com, you can actively control it, or automate it so that it reacts to schedules and triggers from your security system. Simply plug it into any wall socket, then plug your chosen appliance into it. You can use it with a lamp, a TV, a cable box, a coffee machine—whatever you like. Security: When you plug a lamp into a smart plug, it becomes a smart light with home security benefits. You can schedule the lamp to come on at certain times, or when you're on your way home, or even when triggered by another device, such as a motion sensor. If there's an alarm event at your home, it can turn on automatically to deter an intruder. Convenience: Smart plugs are great for automating everyday kitchen devices. You can start your day with your coffee machine already working, or your tea kettle already boiled. If you like to slow-cook, you can load up your Crock-Pot in the morning and switch it on with your smartphone from work. Energy Savings: Smart plugs can put a dent in your energy bills by automatically turning off appliances like your TV and cable box, which consume energy in standby mode, when you're not home. With Alarm.com, you can have them switch off when you arm your security system, in the same way that your smart thermostat sets back. 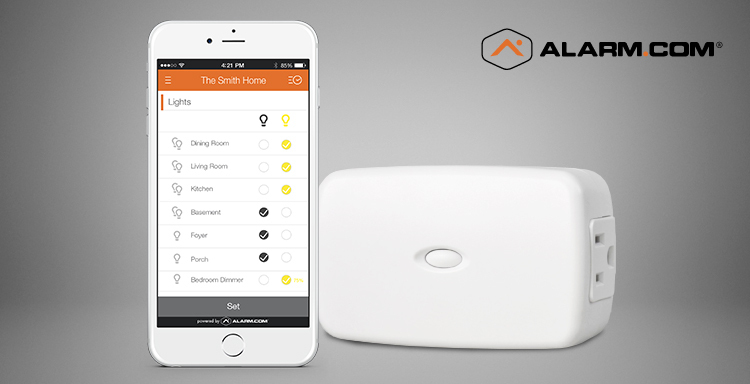 To enjoy all of the benefits above, get your smart plugs as part of an Alarm.com solution, where a single app connects every device. To connect with an Alarm.com service provider, click here.